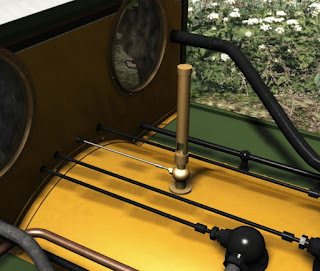 Today we are going to take a look at the optional parts available for the rebuilt A1X Terriers. 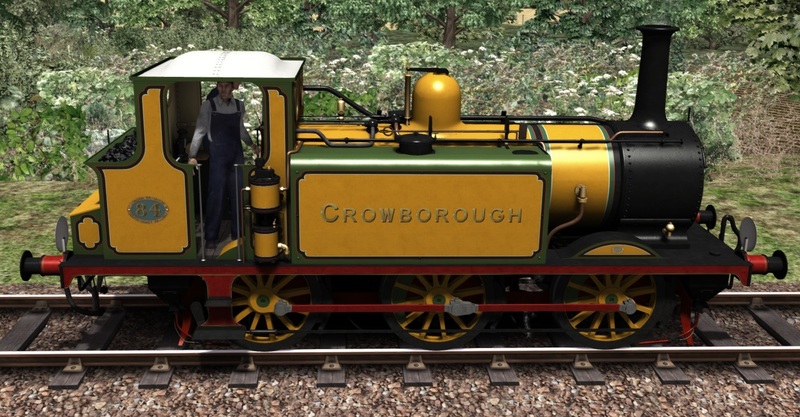 These parts will eventually be available for ALL liveries, but today will only be shown on the completed Stroudley Improved Engine Green version - so if you think some (or all!) of these options weren't available on this named loco in this livery... then you are very likely correct! It's a sample of what will be available on ALL liveries we provide - which will hopefully be a lot! So lets begin with the A1X as "standard". All of these listed options can be selected using the locomotive numbering system in the standard scenario editor, and changing the first of these characters allows us to change the frames from red to black (which is the standard on most other liveries). 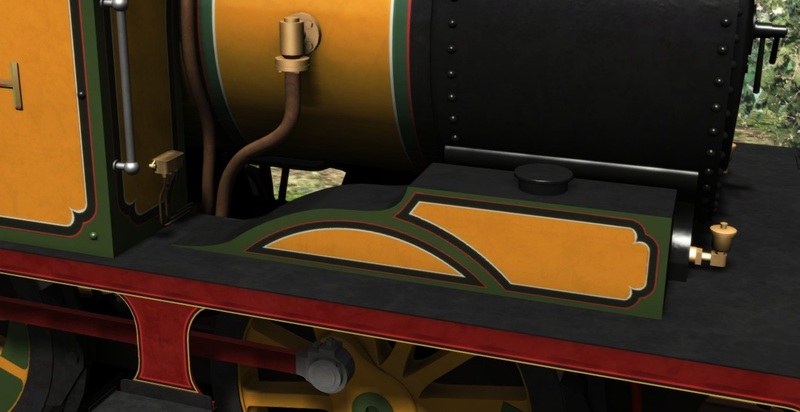 You can also choose to have the visible Westinghouse brake system removed as some engines did. Next up is the choice of the bunker and extra bars. The above pictures shows the coal bunker as built which could carry just over half a ton of coal however various ways were introduced to make the Terriers go that little bit further. The Kent & East Sussex railway used a different set of open bars (3) but eventually they rebuilt their bunker to be slightly higher (4) but even this wasn't enough and they added bars as well (5). The largest bunkers were those modified by the Isle of Wight Railway who kept the same height but extended it rearwards right up to the buffer beam (6) allowing almost 1 ton to be carried. Chimneys come in 3 different styles; the original Marsh chimney (left) which was fitted when the A1X's were re-boilered from the A1 engines. Centre is the Drummond chimney fitted to some of the engines rebuilt by the Southern Railway and finally the Isle of Wight cast chimney. 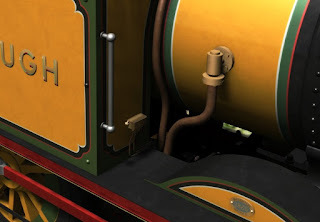 To run on the Southern Railway network a system allowing for 6 lamps or discs rather than the standard 4 was required and this was achieved on the Terriers by adding lengthened brackets allowing 2 more lamps or discs to be "stacked" on the left or right sides. Many of the Terriers had their lubricators changed during their lifetimes and additional oil feed boxes were often added to the front of the tanks. The Isle of Wight Railway also added handles to the tank fronts on some of the engines - presumably to make them easier to climb up to for watering! A common attachment to a Terriers chimney, especially on the Hayling Island branch line, was a spark arrestor. These were designed to stop the small fragments of burning coal that were often thrown out of a steam engines chimney when they were working hard. We've read various reasons for why they were used (sparks could set lineside grass and bushes on fire for example) but on the Hayling Branch it seems to have come from the danger of setting light to the wooden bridge over Langstone Harbour. During their time under Southern ownership some A1X's were fitted with a Drummond dome and safety valves. The Isle of Wight Terriers had a "hooter" fitted rather than the traditional whistle. Also part of the Isle of Wight style of rebuild; rather than adding the small curved splasher these had a combined splasher and sand box which was more akin the original A1 splasher style and was lined in a similar fashion. 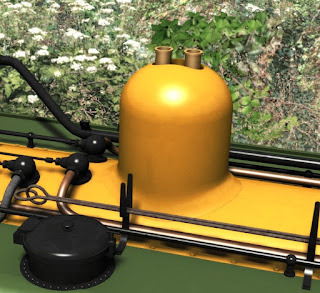 Finally putting some of these options together we see below a fully kitted out Isle of Wight (IOW) rebuild using: IOW bunker, IOW cast chimney, lubricator boxes and handles on the tank fronts, IOW hooter and IOW splashers. 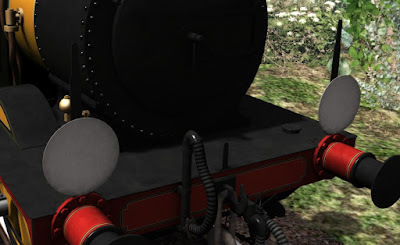 Also shown are the additional weights added to the front and rear wheels by the IOW Railway. As you can see there are many ways that you can choose to have your A1X set up and these options will be available for all liveries. 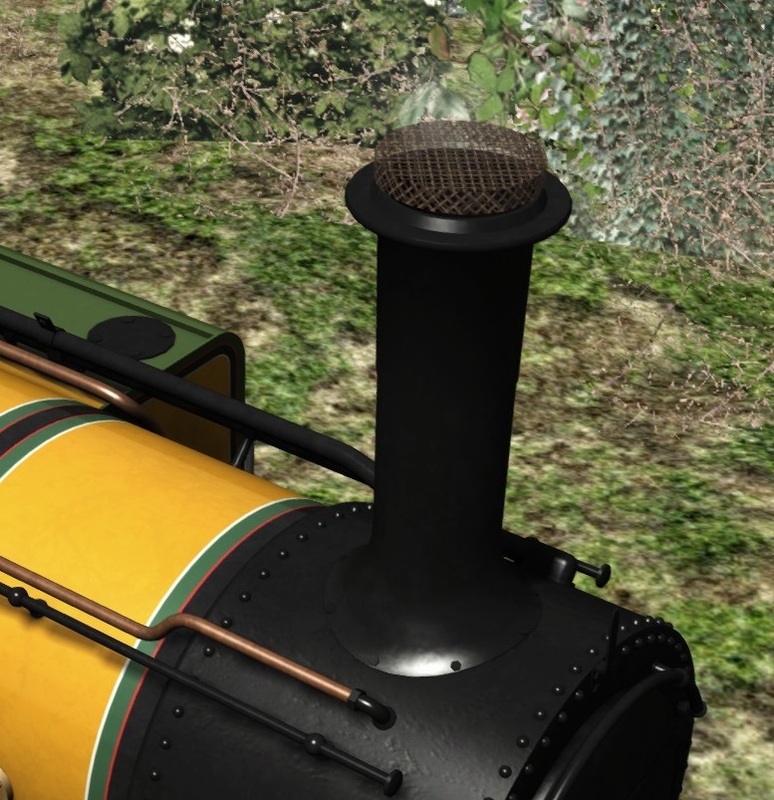 We will of course include pre-made lists when you place down any Terrier in game which will show the correct names, numbers and fittings for each livery provided. Next time we'll be taking a look at either some LB&SCR coaches or another livery depending which have progressed the most! Since it technically carried SIEG in its BR Life will 32635 "Brighton Works" be included in this livery? We plan to do a special filthy SIEG livery for Brighton Works. 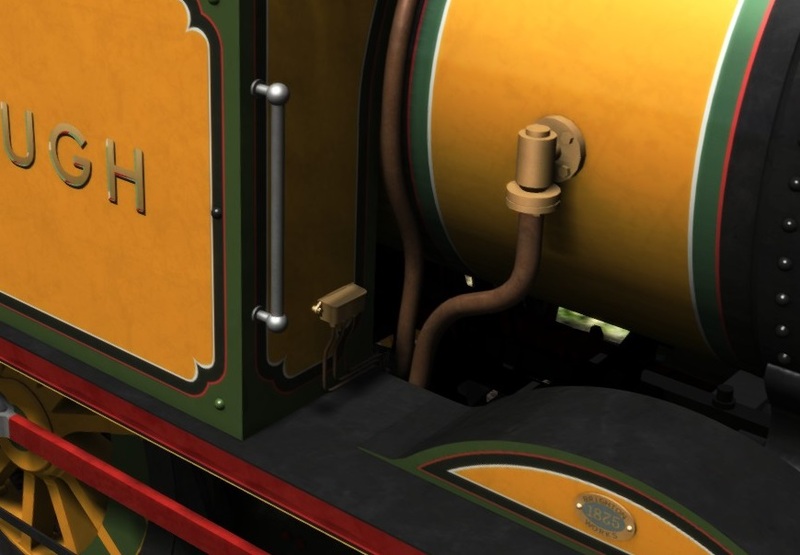 Im still trying to figure out how to change the terrier so it looks like a one of a kind engine, like changing the whistle, the coal bunker, etc. How do I go about that?